A low clarity eye-clean diamond will look identical to a flawless diamond assuming all else is equal (yet will cost far far less). 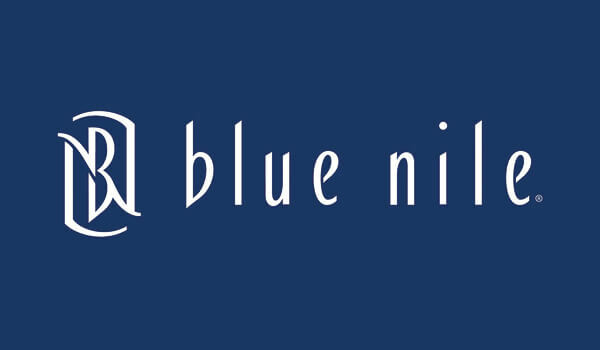 At present the only vendors offering sufficiently high quality images of their diamonds for reviewing clarity is James Allen and Blue Nile. With their technology, you are able to find diamonds like this beautiful SI2 from Blue Nile that saves you almost 22% over a mediocre VS2 like this from James Allen or one like this from Blue Nile. If you are feeling a little unsure of yourself, feel free to contact us. After helping thousands of readers, we have quite a bit of experience sifting through these images and figuring out which diamond is eye-clean. Natural diamonds are formed in the earth’s mantle layer at a depth ranging between 80-120 miles, and they face extreme heat up to 2,200 degrees Fahrenheit. While their growth takes between one billion to three billion years, only the rarest diamonds emerge in perfect condition. Most often they are imperfect and contain varying amounts of internal inclusions and surface blemishes. Diamond clarity is a qualitative metric that grades the visual appearance of each diamond. The fewer inclusions and blemishes the diamond has, the better the clarity grade. While the clarity can significantly impact a diamond’s value, imperfections typically can’t be recognized by the naked or unaided eye. If you want help finding a diamond that has inclusions, yet is eye-clean, feel free to contact us. How Are Clarity Grades Determined? When determining the clarity of diamonds, experts will note the appearance of the diamond when it is face up, with a microscope at 10x magnification and eye visibility. However, to identify any diamond inclusions there may be, a higher power than 10x will be used. Otherwise, it may be too difficult to determine. Five factors play a significant role in how the clarity grades are determined. These five roles in diamond grading include size, nature, number, location, and the relief of the inclusions. The size of the inclusion is important because the bigger the inclusion, the bigger impact the inclusion will have on the diamond’s clarity grade. The nature of the inclusion is simply regarding the type of inclusion that is present. It also discusses the depth and any other characteristics that can be found within the diamond. If there is anything that is situated only on the surface of the diamond and has not penetrated the diamond, then it is referred to as a blemish, rather than an inclusion. The clarity grade of a diamond will be much lower when there is the presence of several different clarity characteristics. 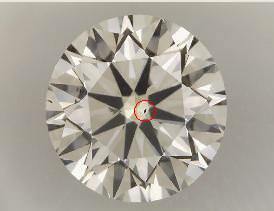 The location of an inclusion refers to where on the diamond the inclusion is located. If the inclusion is situated in closer proximity to the center of the table, then the clarity grade will be impacted much more. If the inclusion is close to the girdle, which is much further from the center table, then the inclusion may be more difficult to see. 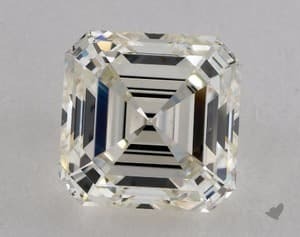 Inclusions found near pavilions of the diamond can reflect, and the facets will then act as mirrors which means the inclusion will then be reflected. 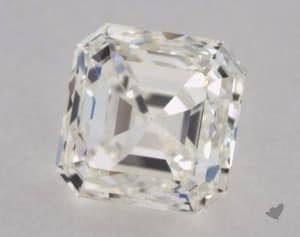 Finally, if you can see the inclusion when you focus your attention past the culet, then there will be much less of an impact on the diamond’s clarity grade. 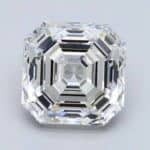 However, certain clarity features may also be slightly obscured or even emphasized due to the shape, proportions, and facet arrangement of the diamond. The relief is referring to how noticeable the inclusion is in contrast to the host diamond. The higher the relief, the darker the color may seem which can affect diamond grading. IF – FL Internally Flawless / Flawless – No internal or external imperfections. Flawless diamonds are extremely rare. VVS1 Very Very Slightly Included (1st Degree) – Diamond clarity inclusions rated VVS1 are not visible at all under 10x magnification. VVS2 Very Very Slightly Included (2nd Degree) – Diamond clarity inclusions rated VVS2 are sometimes just barely visible under 10x magnification (standard jeweler’s loupe). When they are visible, they are quite difficult to find and can often take quite a while to locate. VS1 Very Slightly Included (1st Degree) – VS1 diamond clarity inclusions are just barely visible under 10x magnification (standard jeweler’s loupe). When looking for VS1 clarity inclusions with a loupe, it can sometimes take a good few seconds until the pinpoint is located. VS2 Very Slightly Included (2nd Degree) – VS2 clarity inclusions are almost always easily noticeable at 10x magnification (standard jeweler’s loupe). Occasionally, the inclusion will be located in a difficult-to-spot location, but otherwise, the inclusion is large enough that it can be spotted quickly under magnification. SI1 Slightly Included (1st Degree) – SI1 Clarity inclusions are easily found with a standard jeweler’s loupe at 10x magnification. 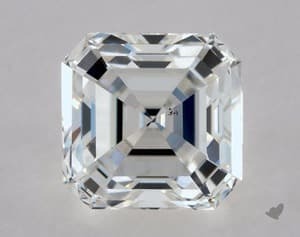 With most shapes (to the exclusion of step cuts like Asscher and Emerald Cuts), SI1 clarity inclusions are almost always clean to the naked eye. SI2 Slightly Included (2nd Degree) – SI2 clarity inclusions are seen clearly and obviously with the help of a jeweler’s loupe. 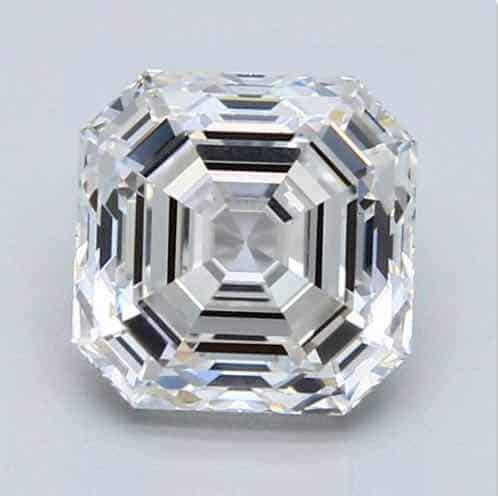 With step cuts like Emerald and Asscher cuts, an SI2 clarity inclusion will most likely be visible to the naked eye. 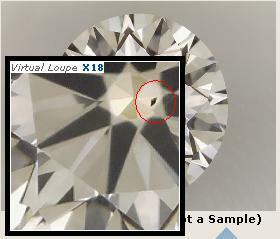 I1 Included (1st Degree) – I1 clarity inclusions are even more obvious and clearly seen than SI2 clarity inclusions. Most I1 inclusions are visible to the naked eye—even on brilliant cuts. The chart above contains real magnified sample images of GIA certified diamonds. I have chosen to use Asscher Cuts & Emerald Cuts for the sample images since these step-cut shapes show inclusions the clearest. 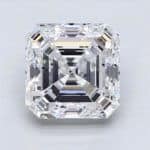 It should become clear from the chart above why it is so crucial to only buy from an online vendor (Like James Allen and Brian Gavin Diamonds) that provides you with high-quality images of their diamonds. 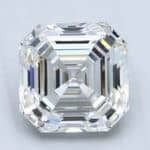 If you see anything at all on diamonds with a Flawless clarity grade, you can be assured that it is merely dust. For example, if you click on the sample image on the table above, you’ll notice on the bottom part of the table, there is a tiny speck. That tiny speck, if it were an inclusion inside the diamond would probably render the stone a VVS2. The tiny pinpoints can only be seen under a powerful microscope. I have offered a sample diamond, but there really isn’t a need. VVS1 size inclusions aren’t visible at this level of magnification. A regular photograph, even a highly magnified one, can only focus on one level of depth. 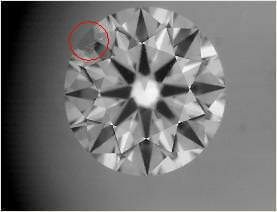 If a VVS-size inclusion is in a diamond, and the image is focused on a different layer of depth, there is no chance the pinpoint inclusion will be visible. If you click the link to the original stone on the table above, you can barely make out the VVS2 inclusions. Generally, however, you need a gemological microscope to identify a VVS2 inclusion since, often, the inclusion pattern is not one larger speck, but a few separate VVS1 sized spots that collectively equal a VVS2 clarity grade. Since each of the individual spots are too small to be seen with a jeweler’s loupe, one needs a microscope to identify them. Unlike VVS2 clarity inclusions, a microscope is never needed to locate a VS1. As you can see if you click on the sample diamond on the table above, a VS1 clarity inclusion is still quite small and will never be visible to the naked eye. VS2 Clarity inclusions are almost always clean to the naked eye. The top sample stone on the table is somewhat of an extreme example. I specifically looked for a VS2 that was black and in the center of the stone to more easily illustrate the size of a VS2 inclusion. 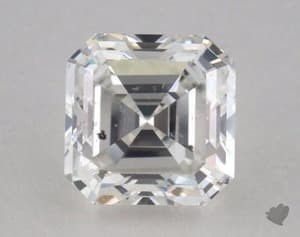 The inclusion in the sample photo might very well be visible to the naked eye as a result of it being black, in the center, and in an emerald cut (which do not mask inclusions at all). The bottom sample stone is a typical VS2. Keep in mind that the inclusion size is in relation to the size of the diamond. When buying a 4 carat diamond, a VS2 is more likely to be visible than in a 1 carat diamond. As with the poor VS2 sample above, the diamond chosen for the sample picture of an SI1 clarity inclusion is an extreme example chosen to show the maximum size and worst possible color of an SI1. One must remember that a clarity grade can be based on many different inclusion points within a diamond. It is less common (especially for SI1 and lower) that the clarity grade is based on one concentrated inclusion. Usually, there are a number of smaller spots and clouds of tiny spots that make up the clarity grade. In these cases, since each individual inclusion is very small, the diamond looks clean to the naked eye. Once you are in this range, you are best off contacting us for help picking something out to ensure its eye-clean. 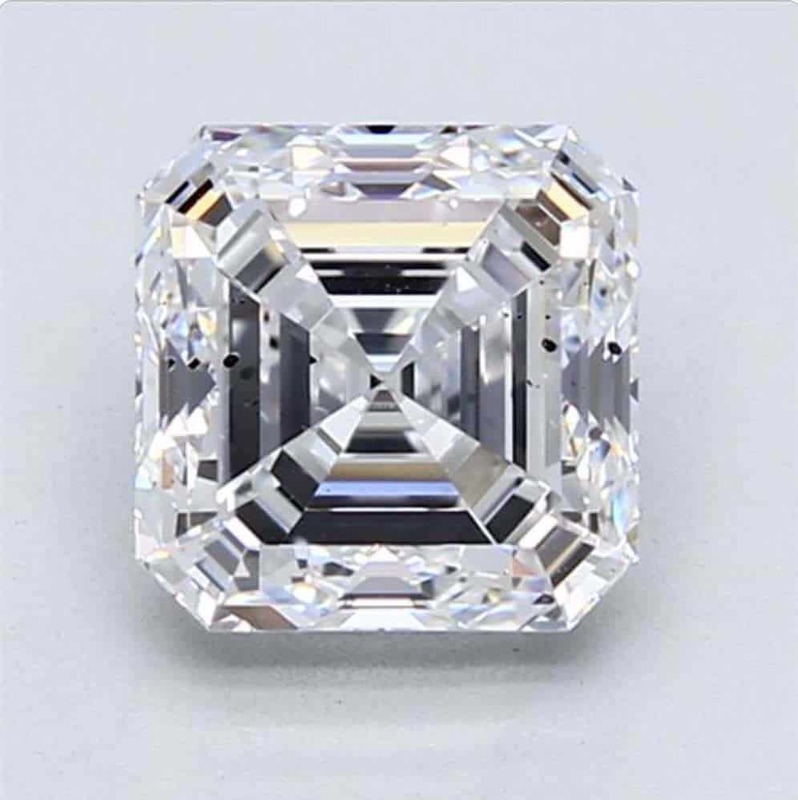 With step cuts like Emerald and Asscher cuts, an SI2 clarity inclusion will most likely be visible to the naked eye (as is the case with the diamond in the top sample photo on the table). With other brilliant shapes (basically all the other common shapes), an SI2 clarity inclusion will usually be clean to the naked eye. As with the SI1 sample photo above, I specifically chose a concentrated black center inclusion to illustrate just how bad an SI2 can get. A center black SI2 on an Emerald Cut is about as bad as an SI2 as there is. As I mentioned above regarding an SI1, in most cases, the SI2 clarity grade is made up of several (or many) smaller inclusions. Another common trait is a “spready” SI2. In these cases, since the SI2 is spread out all over the stone, and not concentrated in any one area, the diamond is usually eye clean. 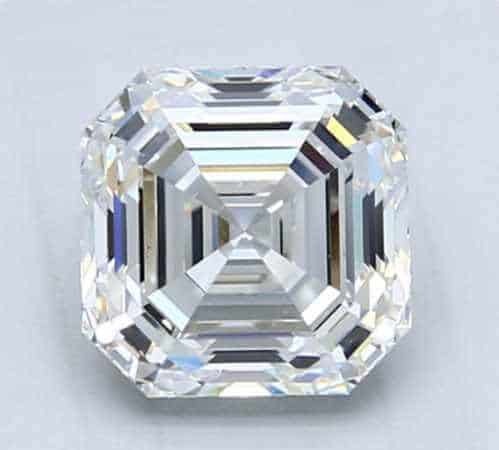 I1 clarity inclusions are so obviously visible on step cuts (Asscher Cuts & Emerald Cuts) that you rarely see them produced. For example, look how awful the sample stone on the table above appears. Just because the sample picture on the right is as hideous as it is doesn’t mean you can’t find a perfectly eye-clean beautiful I1 clarity diamond. As I mentioned above, most clarity grades are comprised of several to many smaller inclusions spread out over the area of the diamond. In such cases, the I1 clarity inclusion will be much less noticeable to the naked eye, if at all. Concentrated inclusions in the center of the diamond are the exception, not the rule. I show them here in this chart simply to show how bad each clarity grade can get. Some companies will try to trick you with an “SI3” clarity. That is a red flag, warning you to be wary. We talk about this more in depth here. Bearding: these inclusions form at the girdle area and may cause a slightly blurred or fuzzy appearance on the diamond. Graining: because of irregular crystal growth, this inclusion causes internal graining that will begin to appear as white, colored, or reflective lines and can cause the diamond to have a very hazy appearance. Cavity: the cavities can appear colorless depending on the type of included minerals that exist within the body of the diamond. If the crystal inclusions of the cavity are colored, they will then be much more obvious in appearance and can most likely be seen with the unaided eye. Feather: this is a small crack that can be found within the diamond and depending on the angle at which it is viewed, it can appear to be transparent, or it can capture light and create more of a white appearance. These are just a small number of possible inclusions you can find with diamonds. It is always best to consider the expert advice of a professional and rely on the GIA (the Gemological Institute of America) to determine the exact clarity grade of the diamond as a result of the different types of inclusions and imperfections that can be found. I could find a VS1 in less time, but it’s only marginally larger than a VVS2. VS2s clarity grade inclusions can be spotted right away with a 10x powered loupe but are usually invisible to the naked eye. When you reach SI1 and SI2 diamond clarity scale grades, however, you begin to find a much higher concentration of diamonds with eye visible inclusions. 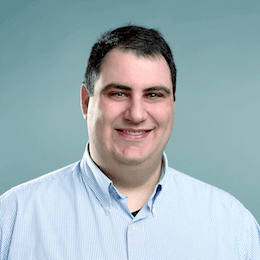 Because of this visibility, it is imperative to limit your search to vendors with high-quality photos. Of course, we encourage you to reach out to us and we’ll gladly help you choose the perfect SI1 or SI2 that is eye clean. Now, if a diamond is simply a product that has features that you want to benefit from (i.e., its beauty), why pay a lot more for features from which you will never benefit? Think of your total investment in a diamond ring as a pie. Each feature of the diamond has its own slice of the pie and the more you spend on a feature the larger its slice (and therefore, another slice or slices must become smaller). Wouldn’t it make sense to apportion the largest slices to the features you can actually derive benefit from? All you have to do for the other features is make sure the slice is sufficiently large that it doesn’t detract from the beauty of the diamond. Unfortunately, though, things aren’t quite as simple as I’ve made them seem. An important thing to remember is that not all inclusions are created equal. Some inclusions are shiny and some are almost completely clear. Some inclusions, though, are dead white and some are even stark black. Some inclusions are dead center in the middle of the diamond, and some are pushed so far off to the side, they aren’t noticed. The clarity grade mainly takes into account the size of the inclusion, and rarely considers the color and opaqueness of the inclusion nor its position. Thankfully, James Allen has some truly fantastic cutting-edge photography that will allow us to review actual clarity examples with a tool they call 360° Diamond Display Technology that provides 18x magnification around the entire stone. 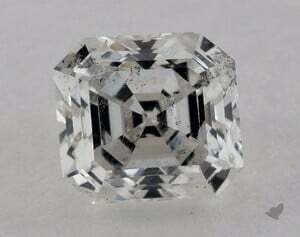 The first diamond I want to review is a 1.00 carat I1. This diamond is a perfect example of the great value you can find if you take advantage of technological breakthroughs like James Allen’s 360° Diamond Display Technology or Brian Gavin Diamonds’ high quality photographs. In Figure 1, which is at 9x magnification, you can barely see anything. Had I not marked the inclusion in red, you probably would not have noticed it at all. The inclusion is only slightly opaque, but best of all it is completely on the perimeter of the diamond. A skilled jeweler could easily cover this with a prong to give your diamond the appearance of being completely clean. In Figure 2, you can see the same diamond, but with 18x magnification. In this picture, I have focused on the inclusion so you can better see how its color allows it to blend in with the natural color of the diamond. The next diamond I want to review is a 1.01 carat VS2. 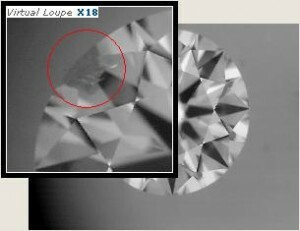 As you can see in Figure 3, there is a very small inclusion almost dead center in the table of the diamond. Unfortunately, however, the inclusion is stark black. Due to the combination of the inclusion’s position and its color, it is very possible it would be visible to the naked eye despite the fact that it has a clarity grade of VS2. In Figure 4, you see the same inclusion, but at 18x magnification. Now take a look at the table below (Figure 5) of the two different diamonds’ features. They are virtually identical, save for three slight advantages the I1 has over the VS2 (No Fluorescence and Excellent polish, and slightly larger dimensions). Now try to guess their prices. The VS2? Listed on JamesAllen.com for $5,010. The I1, which as I have shown isn’t simply a better value for your money spent, but is objectively speaking a better looking diamond? $3,290. The greatest myth about diamonds is that they are a smart investment. Edward Jay Epstein, in his industry-shaking exposè on the “Diamond Invention” entitled “Have You Ever Tried to Sell a Diamond?” clearly and emphatically puts this idea to rest. We also recently covered our opinions on the resale value of a diamond. I recommend any prospective diamond buyer first read these articles from start to finish. It’s important to be in the right frame of mind when making such a major purchase and not be influenced by all the magic and emotion thrown at you from DeBeers advertising. And of course you can always ask us for personal help making this decision. Diamonds are a retail product just like any other. The product goes through various stages of production and distribution (mining, polishing, distribution, retail, and finally customer). As the diamond changes hands, each participant takes their cut. By the time the finished product ends up in the customer’s hands, the price is sufficiently inflated that you could never sell it without losing money. If cars lose 15% when they leave the lot, then figure most diamonds probably lose at least 30-40% when they leave the store. The VS2 costs over 50% more than the I1! And you know what you get in return for that $1720 extra you spent on the VS2? A little black dot to always remind you of what a bad decision you made. To wrap things up, recall the pie analogy I mentioned earlier. Wouldn’t it make more sense to keep the Clarity slice nice and small (like the I1 from Figures 1 and 2) and instead increase the size of the Weight slice? 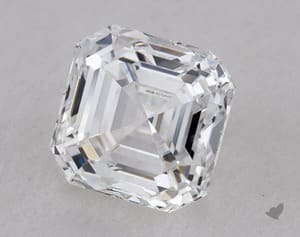 In our example here, you could easily upgrade to a 1.25ct diamond and you would still end up spending less than $5,010. 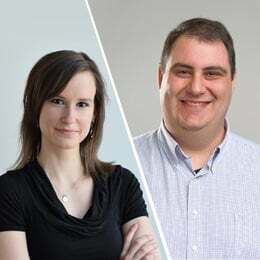 Additionally, when purchasing a diamond, follow the advice found within this article, set your estimated budget, and reduce the clarity to stay within your proposed budget. Next, you can also choose to reduce the color of the diamond as well to gain even more of a value.